Are you spending twice as much money as you did last year to feed your livestock? Are you struggling to find good hay for your livestock? Or maybe you even had to sell some of your animals because feed is so expensive and difficult to find? If the answer to any of these questions is yes, you need to read further. We may have a solution for you – Aquaponic Fodder! OK, what is that? 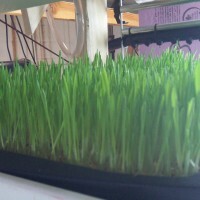 Aquaponic fodder is young grass that has been grown from grain or grass seeds in 6-10 days. It’s usually done in a controlled environment using very sustainable earth friendly technology. This 6-8″ long green grass is fed directly to your livestock as a replacement for grain and for a significant percentage of your normal hay feeding amounts. We are livestock farmers just like you, and we have struggled this season with our feed needs. Proper nutrition is vital to the success of our carefully monitored and strategist genetic improvement program. We are also passionate about using sustainable farming methods in our farming and we want to teach others how to do the same. We have been producing aquaponic fodder here in Northern Colorado at the Center for Ecolonomic Excellence and feeding it to our show quality alpacas. We are very selective about what we feed &amp; this has been a very exciting addition to our feeding process. We will be reporting on our results with this new technology through our Mountain Sky Alpacas and our Nourish the Planet Membership Community. We will be marketing a unique livestock nutrition plan to selected clients which will include an Aquaponic fodder program. Watch for all of this as we roll this program out!! Email us at waynedorband@gmail.com or call us at our offices at 303-495-3705 for more information. We look forward to sharing more with you. What are the water Needs for these Aquaponic Fodder systems? Differences Between Llamas & Alpacas – Ever Wonder What they are? I am a medical doctor in Ghana with a cattle farm. I need your seed foda and drinkers to buy. Please help.